David Blake and Binkie. Photos ©LizCrawleyPhotography. Mill Spring, NC – July 9, 2015 – The luck of the Irish continued in the George H. Morris Arena at Tryon International Equestrian Center (TIEC), as David Blake (IRL) aboard Binkie, owned by Pine Hollow Farm, captured their third FEI win at TIEC this season. Blake piloted Binkie to the only double-clear round in the $34,000 Suncast® Classic 1.50m FEI, edging out Alison Robitaille (USA) and Cassinja, who dropped a rail in the jump-off, finishing in 39.84 seconds. Blake and Binkie crossed the timers in 45.38 seconds with a clear round in hand to secure the win. Kristen Vanderveen (USA) and Bull Run’s Testify finished in third, with a single time fault in the first round of competition. Tryon Summer 2 continues through Sunday, July 12, with the entire Summer Series concluding on July 19. “I was in the same scenario during the grand prix two weeks ago and it’s a nice position to be in, but also puts on a lot of pressure on to get the job done. I know he’s a great jumper and I never really worry about him pulling a rail. I absolutely trust him and feel confident that he can go around clean every time we get into the ring,” commented Blake. The duo’s consistency has kept them atop the leaderboard in the larger FEI classes offered at TIEC amongst a slew of talented international names and Blake sees Binkie as a real contender at the top levels. His laid back personality and willingness to fight in the ring are all signs that the best is yet to come. Giving Binkie time to recuperate from a string of stellar performances at Tryon Summer 1, Blake was impressed with the gelding’s efficiency and carefulness in the ring today. “He felt super. He had last week off and it’s great for him to come back now in the same good form he left with after his big win on Saturday night,” he said. Haley Gassel of Lenoir City, TN made a swift move up the leaderboard in the $10,000 Under 25 Welcome Classic aboard Quite Dark 2 owned by Westwind Equine Training Center, as the last rider on course in the class of 23 entries. Gassel and Quite Dark 2 tripped the timers in 33.743 seconds to edge out Kira Kerkorian of Sagaponack, NY and Cassi, who placed second in 33.864 seconds. Lucas Porter of Bartonsville, TX and Phineas finished in third place with a time of 34.24 seconds. The class was postponed from its scheduled Wednesday finish to Thursday morning as a result of inclement weather. Gassel piloted Quite Dark 2 to victory in an immediate jump-off format. Gassel and “QD”, as she calls him around the barn, are coming off of a third-place finish in last week’s $15,000 Under 25 Grand Prix and captured their first TIEC win this season today. Gassel’s massive 2005 Holsteiner gelding (Quality x Elegaz) has an aura about him in the ring and his confident attitude allows the duo to immediately find their stride in big-atmosphere arenas. Gassel and Quite Dark 2 will be back looking to add to their top placings on Friday in the $25,000 Under 25 Grand Prix in the George H. Morris Arena. As the pair generates more buzz around the show grounds, Gassel is hoping that one day she will be able to represent the United States in team competition like a Nations Cup, as she represented Zone 4 at the 2014 Adequan® FEI North American Junior & Young Rider Championships and thoroughly enjoyed riding with a team. “It was a great experience and QD really took it in stride. I loved the team competition atmosphere and would love to have the opportunity to do it again. We started off at 1.20m and have worked up from there pretty quickly. They’re big goals, but that’s part of the fun too, getting there and enjoying the process,” she smiled. Cathy Geitner of Aiken, SC typically handles the day-to-day operations of Daniel Geitner Stables, letting her husband, Daniel Geitner, do the legwork in the ring, but today Cathy stole the show, championing the 3′ Pre-Green Hunters aboard 2009 Dutch Warmblood mare Keepsake. Daniel followed with Reserve Champion awards aboard Douglas. The mare finished with blue ribbons in both over fences classes in yesterday’s portion of the division with Geitner piloting from the irons, also collecting a second place in the under saddle hack. “She’s a super jumper and is so brave. She has a ton of scope and when I go in there I don’t worry about the jumps at all, it is more on keeping her focused and helping her learn what her job is in the ring,” she explained. Keepsake has incredible natural ability and will make an excellent prospect for the future. Geitner is looking to move the mare to the First Year division when they return to Florida for the winter season. As for beating her husband, Geitner was all smiles and said it takes a very special horse to get her back in the ring and the little mare convinced her to give it a go. Competition at TIEC continues tomorrow with the $34,000 1.45m FEI Speed Stake, $5,000 USHJA National Hunter Derby, and the $25,000 Under 25 Grand Prix. 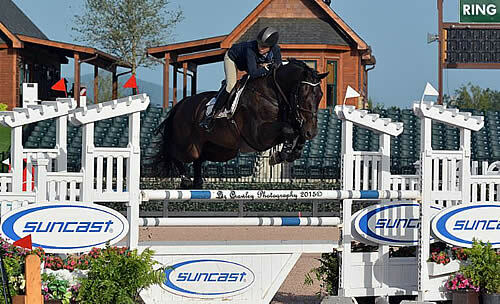 For a full list of results and a weekly competition schedule, please visit www.tryon.com. Please “Like” the TIEC Facebook page at https://www.facebook.com/pages/Tryon-International-Equestrian-Center to be eligible for various contests and promotions.